Two extra weeks of waiting to play did nothing to dampen the spirit or intensity of the Fox and Hound Teams Friday in the first Fox/Hound competition of the year. Rescheduled from November 17 to November 30 because of an early-season snow storm and ensuing power outage, New Girl Runnings and both Big and Little field hockey games were as much fun as always, with the Foxes winning the race, the Hounds sweeping the games, and the true spirit of the tradition — true friends ’til the end — carrying the day. The very busy day, which started with morning classes and an Admission Open House, concluded just ahead of sunset as the Hound Big Team collected a 2-0 victory over the Foxes with two second-half goals. Earlier in the day, the Cub/Puppy Game went to the Hounds as well, also by the score of 2-0. 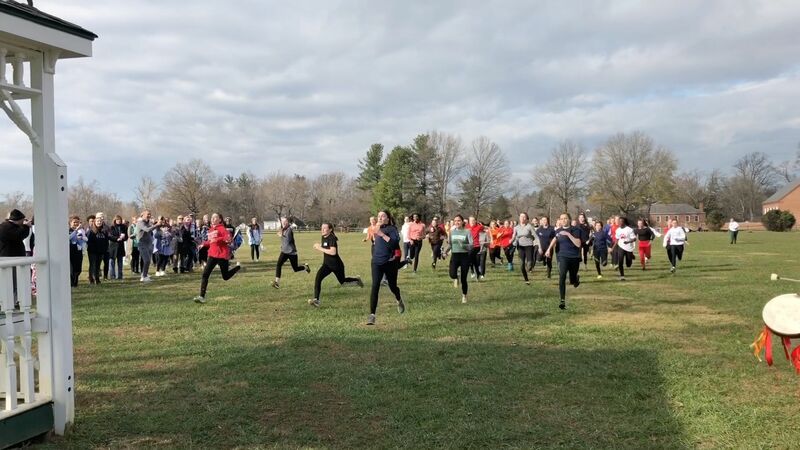 New Girl Runnings, however, gave a victory to the Foxes after freshman Gracen K. reached the weathervane atop the gazebo in Big Track ahead of all the competition. Gracen wasn't the first girl to get to the gazebo but her quick scrambling up the side of the structure gave her the win for the Fox Team. Sophomore Puppy Team Captain Ellen B. scored about 10 minutes into the first half to put the Hounds on top early in Little Game and freshman Jordan M., assisted by senior Carsyn B., added a goal in the second half to pretty much seal the victory for the Hounds. In Big Game, too, the Hounds seemed the stronger squad but outstanding defense by Fox Captain Leah S. ’19 in goal, Big Team captain Louise W. ’20, and others led to a scoreless first half and a very exciting game. Even after Loren S. ’19 put the Hounds on the board early in the second half, the game remained exciting and intensely played. Senior Willa C., the Hounds’ Cheerleader, added a goal late in the game for the 2-0 win. Preparations for the hockey games began long before Friday — nearly a month, in fact — with student-run tryouts, team selection (announced at Teas on Nov. 12), and practices. When the power went out after several inches of snow on November 15, with no guarantee of returning any time soon (the power company suggested it might be out until late Saturday, November 17! ), the schedule was reworked, with Big Sing Sing, New Girl Runnings, and both hockey games postponed until after Thanksgiving Break. Students took the changes in stride and mustered as much enthusiasm, energy, and intensity as ever when competition time came around. And when it was over, the friendship for each other, regardless of team affiliation, and love and respect for the Fox/Hound tradition was clearly in abundance. Last Thursday evening, everyone put on their Fox/Hound finest for Big Sing Sing. The Houndy freshmen Olivia J., Ceci M., Caroline B., Amelia F., and Gigi G. donned orange, red, and yellow. Before Sing Sing came to an end, Big Team Captains exchanged cakes with the opposing team. Hound Big Team Captains Abby A. '20 and Janie W. '20 made their way to the Fox Room. . .
. . .and Fox Captain Leah S. '19 accompanied Big Team Captains Allie M. '20 and Louise W. '20 to the Hound Room. Friday's schedule of events got off to a quick start with New Girl Runnings. While the Hounds scrambled up the gazebo in hopes of reaching the top. . .
. . .it was ultimately freshman Fox Gracen K. who topped out first! See video of the complete race on the main page. Here with proud Foxy friend McKenna O. '21, Gracen not only claimed bragging rights for the Foxes but her win supposedly predicted what the outcome of Big Game later that day would be. Was a Foxy victory in store? Only time would tell! Shortly after New Girl Runnings, Hounds Johanna B. '22, Josie N. '22, and Irene F. '19 eagerly awaited the start of Little Game. Freshmen Foxes Brooklyn D., Ella S-C., Paige C., Elizabeth S., and Adair S. were ready to cheer loud for their team! Before the first whistle blew, freshmen Hound Little Team teammates Ceci M. and Jordan M. exchanged a hug for good luck. And then the action was underway! The competition between the Foxes and Hounds, including sophomores Moni C-P. and Susannah M., was fierce. Along the sidelines, the Foxes watched with anticipation as the game unfolded. . .
. . .and, across the field, the Hounds were equally enthralled! Freshman Hound Remy P. got low to stop the Foxes in their tracks. Hound Little Team Captain Ellen B. '21 would score, and the Hounds won Little Game 2-0! 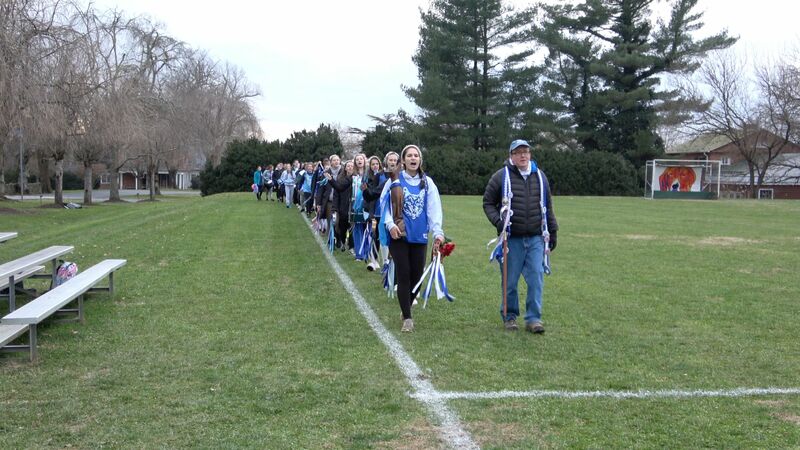 The traditional March In took place just before Big Game, with the Foxes, led by Fox Captain Leah S. '19 and Foxy Fellow Alex Northrup, taking the field first. . .
. . .followed by the Hounds, led by Houndbacker Patty Boswell and Hound Captain Haley B. '19, pulling a wagon with Manager Holland D. '19 who was injured. The teams met at midfield and cheered with plenty of heart. . .
. . .with special songs for the Houndbacker, Foxy Fellow, faculty, and alumnae. Both teams began to make their way across the field in a measured and traditional march. . .
. . .meeting with much ceremony at midfield. Hounds (back) Maddy W. '20, Lily F. '19, (front) Elena B. '20, Roxy C. '19, and Bianca M. '21 were excited for the main event — Big Game — to get underway. With megaphones and drums in hand, Clare T. '22, McKenna O. '21, and Georgia G-S. '20 were loud and proud Foxy fans! As the game got underway, players on both sides, including Fox Nia D. '22 and Janie W. '20, found the teams fairly well matched. Betsy A. 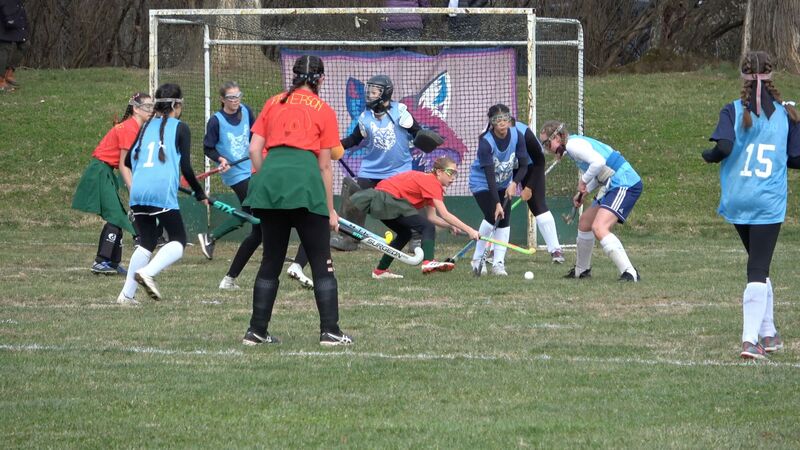 '21 stepped up on defense for the Foxes as Hound Captain Haley B. '19 got ready to take a shot. Fox Captain Leah S. '19, who plays goalie during the spring season for soccer but does not play field hockey, made a number of incredible saves throughout the game. With a tie at halftime, Big Team captains from each side exchanged a high five as they crossed paths while switching the goal banners. While the teams conferred and talked strategy before the second half began, sophomore Hounds Ellen B. and Shea H. held a little friendly swordfighting competition of their own. Shortly after the second half got underway, Loren S. '19 put the Hounds on the board. 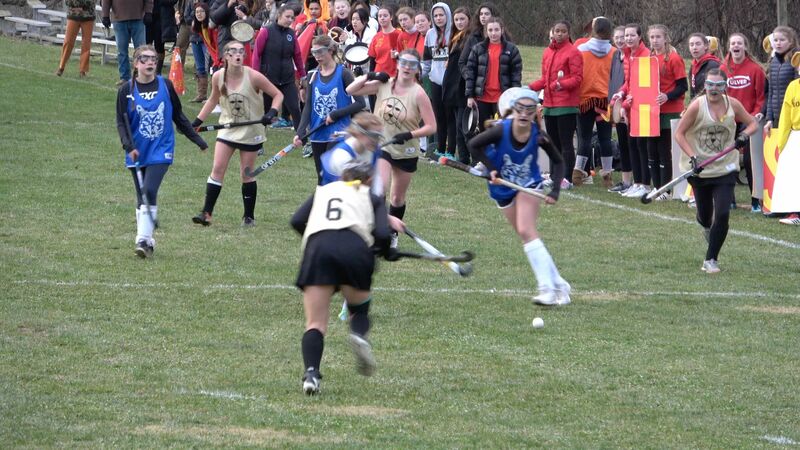 Senior Willa C. followed with a second goal for the Hounds later in the game, clinching a 2-0 Houndy victory. Congratulations to the Hounds on their Little and Big Game victories, to the Foxes for winning New Girl Runnings, and to everyone who keeps this tradition alive and thriving today!